Mar 07, 2018 (LBO) – Sri Lanka has temporarily blocked social media web sites like Facebook, Instagram and WhatsApp to avoid the spread of hate speech in the country. The Cabinet Spokesman Minister Rajitha Senaratne on Wednesday said the government has decided to block access to certain social media. Telecom Regulatory Commission (TRC) has started to monitor all social media platforms to curb hate speech related to communal riots escalated in Kandy district. Telecommunication service providers (ISPs) have also restricted internet access in Kandy district on the instructions of the TRC. 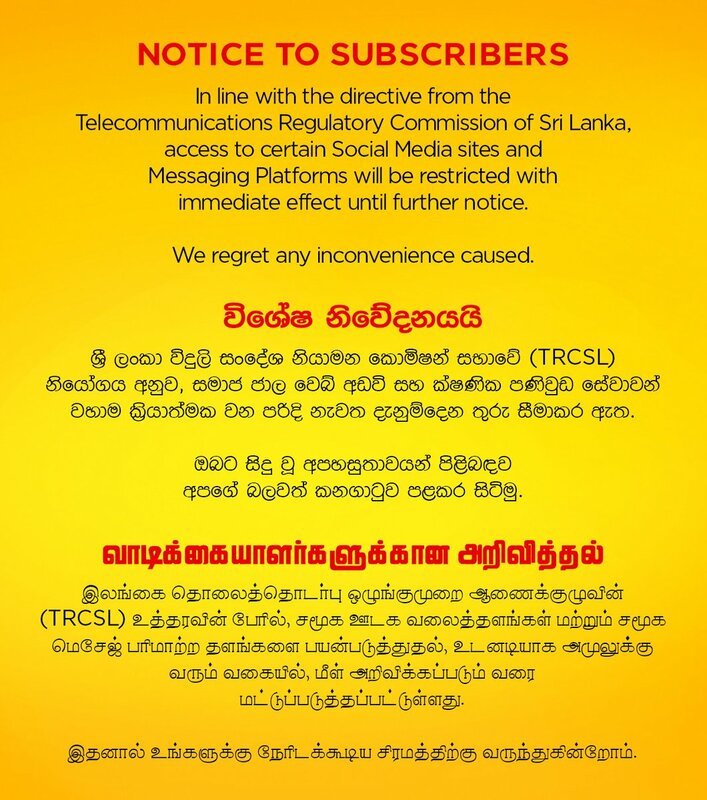 Sri Lanka Telecom said in a twitter message that in line with the directive from the TRC, access to certain social media sites and messaging platforms will be restricted with immediate effect until further notice. Reuters, however, said in a news report quoting a TRC official that the directive will last for about 72 hours. Notice issued by Dialog Axiata is reproduced below.